Being watched I was as I did some experimenting with paint yesterday. Experiments are fun - experiments are crucial to learning new things. Time is never wasted playing with paints! This experiment was to find out which -if any- technique or combination of washes I preferred for using on the body of the village church. So the photo below is the experiment - done before I took Missy for a walk. That was what she really wanted - not to watch me paint! I enjoyed art at primary school, open evenings found me demonstrating my drawing ability. When it came to the serious business of exam study, art was left behind when I went to secondary school and concentrated on academic study. I returned to art some 25 years later, when self employed, mainly as a hobby. Then the local college offered an evening course for adults, giving a City & Guilds qualification in art. The course lasted two years, culminating in the presentation of three folders of work and three framed paintings. I am proud to say I passed with flying colours. Theatrical Halloween - the painting above, was one of my three framed pieces. So, never too late to learn. Its our 20th wedding anniversary today. We're going out for the day, probably to the coast. So there'll be no painting today, though I am sure there'll be lots of photos which will give me inspiration for future work. There in my profile I mention I am a dog lover. I have my own dog, a parson jack russell called Missy. 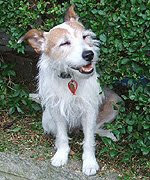 She is a typical terrier and has a mischievous glint in her eye. Her nickname is MissyChief. She is a beautiful little girl - frequently her poses are such that I do paint her. She's a cracking artist's model. Here are some examples of the artwork I've done with her in it. The darks are in and Wilbur is complete. He's a fine figure of a German Shepherd. I'm pleased with how he's turned out. Do I ever work on more than one painting at the same time? Summer school week two was on Friday just gone, so I took something new to draw and paint. Firstly, I didn't want any to accidently knock me whilst painting Wilbur and thereby spoil his good looks. Sometimes we have to share a table and that can happen. Secondly, I knew what was needed to finish him, so to take advantage of the tutor's expertise, I decided to take a style not painted before. The local village church is of flint construction. Never having painted any flint building before, it was somewhat of a challenge - and one I may well need the tutor's help with. This is it so far, with drawing, sky and background fields complete. There are partial washes over the two roofs and the walkway through the lych gate. Today I have added a red collar to Wilbur. Because he is a long haired German Shepherd, you don't get to see all of the collar, just a few glimpses of sections here and there. The collar may stay as it is, or it may yet be covered by long fur. It is a variable at this point, because until I paint the dark fur in, I won't be completely sure how well it looks. All that's left now for me to do is to paint the darks of Wilbur's top coat. Wilbur now has his nose - and a glorious wet nose it looks! I have also added a shadow under his top jaw on top of his tongue. This helps to make the snout stand out more from the lower part of the dog. Today I have added the eyes to Wilbur's painting. Now he starts to come alive! I try to paint eyes expressively, because in the eyes the owner will see all the love the dog held for them. Its the one part that absolutely must be right. I paint from my heart when I paint eyes, hopefully that will show. I'm pleased with how Wilbur's eyes have come out. Today's post is a tribute to a beautiful girl who passed away yesterday. I had the honour of meeting Roxy - The Duchess- and became firm friends with her mum. The Duchess was a little sweetie, who will be sorely missed. Until the day we meet again in Heaven, rest easy Duchess. Look down kindly on your mum whose heart is breaking from the separation. In this stage a mix of raw sienna and burnt sienna was applied all over Wilbur following the same areas worked on in the last stage. It has the effect of deepening the coat. The wash goes even where the black will be, because shepherds do have a double coat and glimpses of sable always come through the black. Slivers of white are left at the edge of his ruff, to help differentiate where the ruff ends and body fur begins. I'm quite pleased with how the dog is progressing, the next stage I will do will be the eyes to bring him more into life. Here is the next stage of Wilbur's painting. A wash of raw sienna has been added wet on wet . This will serve as a foundation colour to all of the fur on Wilbur, be it light or dark. It will help tie the two together. Wet on wet is a technique where you wet the paper first and then add the watercolour wash into it. It makes the colour flow and blend beautifully. I like this stage, you can see the dog coming to life more. In this stage I have painted the ears and the tongue with a glaze of rose madder and deepened the glaze in parts. The parts I have deepened will be the most visible parts in the finished painting. For instance, although the ears have a glaze all over them, only the deepest "pink" will not be covered by a layer of paint to represent fur. I thought it might be interesting to post a stage by stage painting. So here is Wilbur - the drawing from Summer School. The background washes were an ultramarine blue for the sky and yellow ochre for the sunlit clouds. This wasn't what was in the photo at all, but that's an artist for you! We like to change things that aren't necessarily attractive into something that is. ( I hope it is!) Artistic license, its called. Wibur's owners will hopefully prefer it too. Summer school for art club starts today! Art club proper is on summer recess, the summer school is a couple of hours on a Friday where we all bring our own projects to work on. The tutor gives help and advice as necessary. I have drawn a picture, which is now ready for painting and the first washes will be laid down today. Some days I only make pencil drawings. This keeps my drawing skills fresh - and black and white can be more evocative than colour. The two pics above are of a friend's cat. The first in her younger days, and the second, her sunset years. Both done from photos - because as anyone who owns a pet will tell you, they don't stay still for long! All part of their charm. Pencil drawings sometimes take me much longer to create than paintings. I think its because with pencil I am more likely to do a defined representation rather than the suggestion of the animal - as in the Chicken painting in the earlier post. I love drawing. I spend hours at a time drawing. Its not unusual for me to look up and five hours will have flown by and I will have been in a world of my own. Very relaxing. Everyone should give it a try . Delightful miniature replicas of your own pet. The above shows my darling Spotty and below my darling Missy. 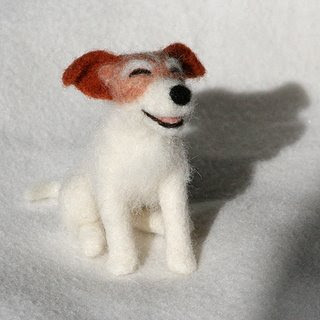 The lady who makes these is an artist in needle felting and I am honoured to own some of her work. She is very talented. Click the link to view her blog and gallery and you will see artwork I guarantee will make you smile. I created this painting as a statement piece. I love dogs and am always disappointed with how easily they are discarded, especially when they show us such love and loyalty. 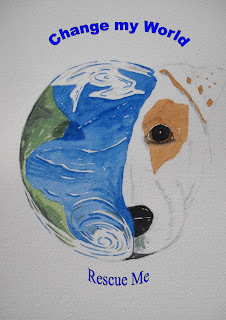 I wanted to make a painting that showed that you could change the world for one dog. You could be that dog's world - and get all his love and devotion. I am delighted that this particular painting has touched the heart of someone involved in the dog rescue world - and it will shortly be used in their publicity and fundraising efforts. I will write more when I have the finalised details. If you ever consider getting a dog, please rescue one. Many are in shelters through no fault of their own, divorces and deaths being common reasons. Change his World - Rescue him. When I first went to art classes, keep a sketchbook was one of the instructions. As it was never explained why they'd be useful, the words went through one ear and out the other, never pausing to gain a foothold in my brain! I had such a rush of ideas I wanted to commit them to the watercolour paper and paint them straight away - which I did. Anyone who was foolhardy enough to say "I like that" would find themselves in possession of a painting - so the idea was lost to me. I gave away lots of my early stuff, just delighted that someone liked it. Now I realise that I have improved - if I had kept a sketch book I could have gone back and re-used those ideas. I try to draw a sketch a day (sometimes I fail) like the little chicken above. He's there in my sketch book and I can use him as a reference for a whole painting or I can slot him in, in a smaller version , in another painting. I try to sketch a little thing which interests me, an animal, a door, a window. They aren't full paintings by any means, but they remind me what I found inspirational or enjoyable to look at. I can always use them, even if I give the painting away! So, if you want to paint, keep a sketch book. Here's what one little sketch of a chicken led to..
Nearly fourteen years ago, I gave up the day job to become a reflexologist. The folks in the steady world of accountancy thought I was barking mad. I probably was. But I wouldn't change one second of it. There's such freedom in being your own boss - and the break gave me an opportunity to return to one of my great loves - painting. I went to daytime classes to fill up my days, initially; then as I got busier I swapped to evening classes. I can still remember my first attempt at watercolour, and the memory makes me laugh. I used nearly a whole tube of red paint on one sunset. I was mighty proud of that sunset until the tutor looked at it and said "It looks like the Martians are coming!" It was a bit red. I'd also not yet learned that watercolour is just that, water first and colour added - not a tube of paint and barely wet. My paintings are a touch different now. Sadly for you, I never photographed that painting, for sure you'd have laughed too. One of my other great loves is my dog. My first dog , Spotty, was a rescue from a bad situation with a neighbour. She was my introduction to the crazy world of jack russell terriers. She used to make me laugh and smile with her antics, yet she was just as obedient to me as any well trained guide dog. I loved her immensely. When she passed away aged 18, we rescued another - this time from Battersea Dogs and Cats Home. She's settled in beautifully once we had a period of training and getting used to each other. Though I never thought I could love another dog the way I did Spotty, I do. Missy makes me smile on a daily basis, I love her immensely. I'd always rescue. So many dogs turfed out through no fault of their own, yet as we can testify, they still make such loving and loyal companions. So here we are, me and my dog and my watercolour paints, journeying through each day, with each day a treasure.